There will be plenty of opportunities for networking during the WCEF2019. As a new feature we will be introducing open discussions for small groups. 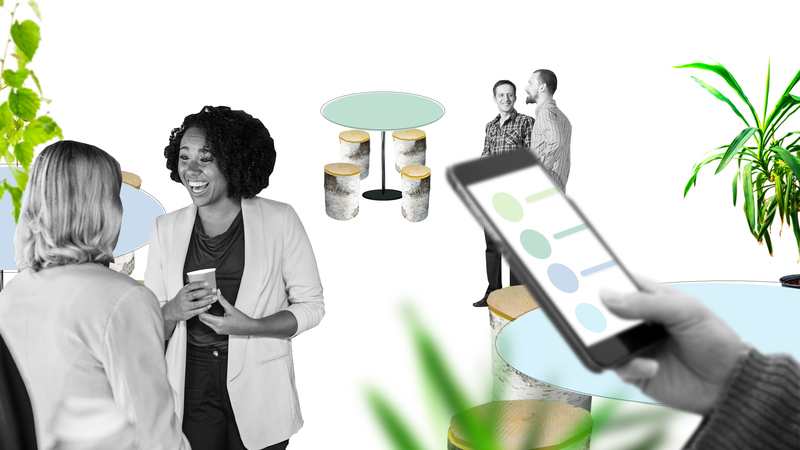 The WCEF2019 mobile application can also be used to set up one-to-one meetings. This year, the World Circular Economy Forum will be offering plenty of opportunities for networking, with some new features to spice things up. You can take part in open discussions around the campfire, set up one-to-one meetings and meet up with other participants at the Expo Area. As a new feature, we will introduce the “Campfire discussion area” in front of Helsinki Hall in the lobby of the main event floor. This area is reserved for open discussions in small groups of up to 10 people, with three to four discussions going on simultaneously, side by side. The agenda and topics of discussions can be found through the WCEF2019 mobile application. Themes of the first campfire discussions will be published in May, when the app is launched. Anyone participating in the forum can organise open discussions on circular economy themes at the forum. Each of these sessions will last 45 minutes and offer the chance to dive into a conversation with other participants around the campfire. Registration for the group discussions can be done through the WCEF2019 mobile application, which will be launched in early May 2019. Participants can also organise a discussion around a specific topic through the mobile app, as well as register to participate in a discussion. If you want to organise a discussion, here’s what to do: Send your topic description and contact details via email to WCEF2019@factornova.com by 30 May 2019. You will receive a confirmation and a time slot for your discussion as a reply. Your discussion will be shown on the WCEF2019 app under “Campfire discussions” and participants can join in through the mobile app. The agenda and topics for open discussions will be available via the WCEF2019 mobile application, which will be launched in early May 2019. Registration for discussions can be made and, if necessary, cancelled via the app. Go to “Campfire discussions” and register for your chosen session. There are only a maximum of 10 places available per session, so be fast and book your seats. There will be a helpdesk located in front of the discussion area. During the forum, you can also go and check the availability of places or available time slots for a discussion. One-to-one meetings can be set up during the forum through the WCEF2019 mobile application. There will be a set of tables reserved for these meetings on the third floor of Finlandia Hall. And don’t forget to make use of all the other opportunities to meet up and mingle with other participants during lunch breaks, at the evening reception, at the Expo Area and at the Smart & Clean pool party. The WCEF2019 mobile application will be launched in early May 2019. The application will make networking at WCEF super easy and allow participants to organise one-to-one meetings and open discussions and to register to take part in discussions. The list will be amended in the WCEF2019 mobile application. The World Circular Economy Forum 2019 in Helsinki, Finland on 3-5 June 2019 will be building the next era of the circular economy.